Bay windows and corner window angle sections for the Kirsch 9046 Architrac system. 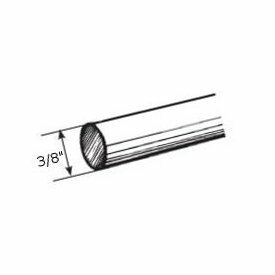 Use splice 9646-061 to connect sides to straight sections and be sure support are used in the bend section for support This is a ceiling mount or recessed ceiling mount product. Allow up to to weeks for production. Extra long drapery rods includes 80 slides and 5 support brackets. Two Way Draw, or center opening. Superfine traverse rods. Extra long curtain rods for the hard to fit window. Truck shipping only. Kirsch drapery rods, Superfine Traverse Rods include drop in brackets, supports and cord tension pulley for installation. Made from heavy gauge steel with a baked enamel finish. Exclusive Kirlon on all sliding surfaces. Push in brackets and extension plates are available as an option. Only the finest pulley sets are used. Strong and durable with a slide gate for easy removal of extra slides. Long wearing, stretch resistant polyester cord and continuous lacing for use at either end or to convert to a one way draw. Two way draw, extends from 160 to 300 inches. Ceylon white traverse rod Slides by Kirsch for superfine and empire rods. 10 slides per bag.